You are what you eat, remember always opt for the healthier choice of food. Recently, Guardian Malaysia has joined forces with MasterChef Malaysia Dr Ezani Farhana and celebrity chefs Chef Zam to create two exclusive recipes for healthy cooking, to help Malaysians stay healthy throughout during Ramadan. At the Guardian Cookout Challenge, a contest organized to encourage healthy cooking to challenge their customers to come up with healthy meals which they could prepare for themselves and their friends and families during the puasa month. 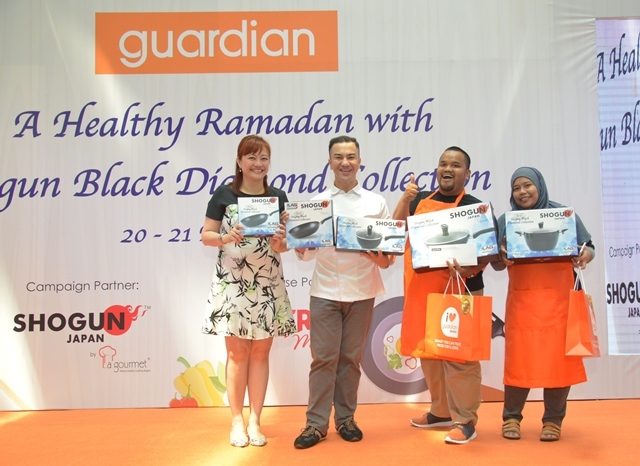 At the same time, Guardian Malaysia also launched its loyalty programme, offering customers the opportunity to own the attractive and high quality La Gourmet’s Shogun Black Diamond Collection, which is suitable for healthy cooking that will be available exclusively through Guardian Malaysia for a period of time. Make a minimum purchase RM30 with any of the 55 participating brands, or a minimum purchase of RM40 without a participating brand. The main partners for the programme are Bio-Essence, Brands, Garnier, L’Oréal and Maybelline. At the Cookout the five teams of finalists selected had the opportunity to use the Shogun Black Diamond cookware to cook up their special dishes. The winning team, Hidayat bin Masduki and Hazimah Md Sidik, took home the entire range of Shogun Black Diamond Collection, worth RM1400 and RM500 worth in Guardian shopping vouchers. The other four teams, each received RM200 worth of Guardian shopping vouchers. Congrats to the winner. Hope can grab one for my mum.